Professional carpet cleaners are available to clean the flooring in your home. 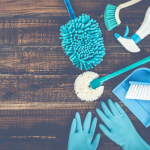 Although it is important to hire these experts annually, do not assume that you cannot take simple steps to keep your carpets clean, even when spills and stains occur. In fact, many products you already have at home may work wonders to remove different types of carpet stains. Carpet stains happen, regardless of how hard you work to prevent them. It is important that you’re always prepared for the worst of the stains so your flooring doesn’t face its demise. So many stains can actually eat away at the fibers of the carpet, diminishing its appearance, life expectancy, etc. The sooner you remove the stains, the less risk of such occurrence. Protein stains, tannin stains, oil-based stains, and dye stains are the most commonly experienced in homes. This includes urine, baby formula, paints, tea, juice, grease, lotion, and many others. Accidents happen, even when your carpet is at-risk. When you are prepared with the knowledge to lift these stains, they’re far less stressful and you can enjoy many more years of great use from your carpet. Do you have white vinegar and baking soda in the pantry? If so, you have an awesome stain remover that effectively lifts a variety of stains from the floors. If you do not have these products at home, they’re sold at all supermarkets and cost just a couple of dollars each. Simple clean the stained area with vinegar and sprinkle with a bit of baking soda. It is important that you add the baking soda after pouring the vinegar to avoid a volcanic explosion! This carpet cleaner works to remove stains like juice, ink, and blood. Did you know that coconut oil can be used to help remove stubborn fat-based stains? Another popular all-natural carpet cleaner. Many people use this oil in their beauty regimen and it works quite wonderfully to soothe the skin. Now it can clean the carpets, too! Just rub a bit of oil into the stain, let it set for 10 – 15 minutes and use an old rag to lift the stain from the floor like magic! Practically any stain is easy-to-remove with coconut oil. Some people even use toothpaste and lemon juice to remove those pesky stains. Use the information above to help you safely and easily remove stains from your carpets. Of course, if these DIY solutions don’t end up helping your home carpet stains, be sure to call in the pros!